Simple enough question, right? It has BIG implications though. I’ll tell you why in a sec, but first let me just say I may be a little different than a lot of people in that I believe your homepage is important, however I also think that with a focus on content marketing, it’s not the biggest entry point into your website as you may think. From search and social media traffic in particular. And that’s totally ok. But your homepage needs to be up to par. 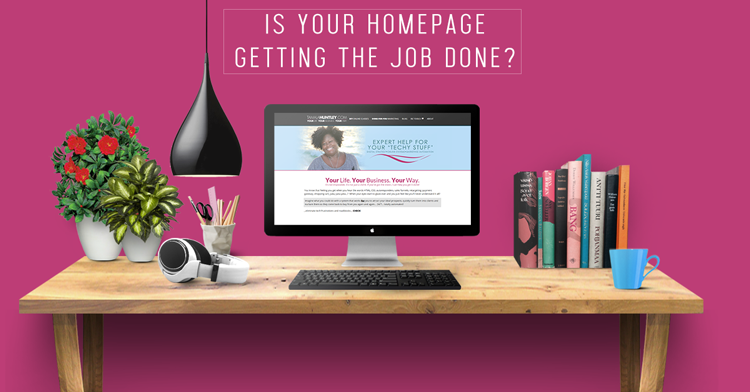 Well, really your entire website, but today we’re just talking about homepages. So what should your homepage have on it? Your Voice and Personality – people buy from people. This may be easier to do when you’re a solopreneur or smaller business, but I think even large companies can still add their company’s personality (i.e. culture) to their website. Nothing creates a great disconnect than seeing you one way on social media and getting to your website and you’re totally different. If you’re a “vibrant” person in real life, bring that vibrancy to your website. Call to Action – this is true with any marketing you do… you have to tell people what you want them to do. If you want them to get your lead magnet… tell ’em. If you want them to take your course… tell ’em. If you want them to request a call with you… tell ’em. (Or ask if you’re being polite.) It doesn’t matter if you just have the information about your services listed on your homepage. Ask them to buy. Lead them to the next step you want them to take. Your Credentials – this just means have testimonials, trust icons (i.e. secure shopping icons) and as seen on logos on your homepage. Things that support the fact that you are an expert at what you do. Testimonials are great for this. And not the ones where you don’t show people’s names or where you use stock photos instead of real people. In this day and age, people see right through that. Credentials show your expertise and authority in your industry. An Entry Point Into Your Funnel – now days most people have this. It’s basically an email capture section where you give away a freebie and get people on your list. But notice I didn’t just say have “an email signup form”… I said an “entry point into your funnel”. That means there needs to be something on the other side of the email signup… a funnel. Not just a “thank you here’s your freebie”. I talk about sales funnels here on my blog. If you want to really grow your business and do it smarter, not harder, you should seriously look at your marketing and sales funnels. I also have a marketing funnels “crash course” that will help you get started. So… take a minute and check out your homepage and see how many of these you have right now. If you don’t have any, get busy. 🙂 If you are using a WordPress theme that doesn’t let you add much more than a listing of blog posts, consider using a landing page plugin like Thrive to give you more flexibility.